In recent weeks the headlines in Ireland were all about the snow and frost that had the country frozen in its tracks around the holiday period, adding to the spate of so many doom and gloom stories for the Emerald Isle. That was on my mind when I, along with a number of other invited guests, traveled to Lincoln Center last Friday to hear some good news from Ireland on a frosty New York City day. Outside the glass-walled Café 65 in Alice Tully Hall the snow fell softly and harmlessly while we were being told of a historic Irish cultural initiative being launched in 2011. A mighty task force led by Culture Ireland and the U.S. Cultural Ambassador for Ireland Gabriel Byrne mounted a strategic comeback in a rollout of the largest cultural offensive in North America ever, at the outset of the biggest cultural conference in the U.S. at the New York Hilton Hotel held annually in January. We were told in many ways how Imagine Ireland, its new campaign for Irish Culture in America, would help spark the right kind of attention to bring Ireland out of its current doldrums. For the past three years. Culture Ireland, the Irish government agency charged with promoting the Irish arts and artists abroad since its inception in 2005, has come to the Big Apple in January to participate in the Association of Performing Arts Presenters Conference broadly known as APAP. The gathering is extremely important in engaging with people in the performing arts world in North America, attracting around 4,000 in the industry who expose artists to a wider circle of influence, so each year Culture Ireland has stepped up its outreach efforts. In the wake of the simultaneous economic collapse of Ireland’s financial, social and political spheres, the need to accentuate and harness the most positive elements of the country were paramount. One of the most important of these were its cultural heritage and artistic talent that had won recognition around the world while also lifting the spirits -- and in more and more cases the pocketbook -- of all those who partook of its many varied streams. To its credit the Irish government was getting the picture that the arts were vital as an economic engine as well as a cultural one reinforced by a Global Economic Forum at Farmleigh Castle in September of 2009 that suggested more targeted action. Taoiseach (Prime Minister) Brian Cowen’s government acted on this and encouraged a specific set of programs be developed that was further enhanced with the appointment of Byrne as a formal cultural ambassador to the wider U.S. community from his long-time base in New York City. The funding and efforts would be managed under the wing of the Department of Tourism, Culture and Sport to which Culture Ireland reports, and $5.2 million was requested and ring-fenced to support the Irish arts in America in 2011 in last December’s budget. To signal the importance of the launch last Friday, Irish Tourism Minister Mary Hanafin joined with New York City Council Speaker Christine Quinn in addressing the Lincoln Center attendees, emphasizing how vital cultural tourism is for presenters, hosts and artists in saluting the new strategy underway this month. With New York City setting a record for tourism in 2010 that included overseas visitors, the importance of cultural institutions and programming to attract them is well documented as a vital industry, and Ireland has taken that lesson to heart and mind. The country would like to see a similar infusion of cultural tourism leading the way back to recovery in the next few years after its bold initiative of 2011. Over the course of the year it is anticipated that over 400 events in 200 cities and 40 states in the U.S. will see some type of cultural activity direct from Ireland that is supported by this special promotional grant. Some of that was signaled in various APAP-style showcase scenarios (condensed) this past weekend in theater, dance and music venues except for longer engagements by the Gate and Abbey Theatre at the Public Theatre and Brooklyn Academy of Music respectively. The West Cork festival features some of the top musicians in traditional music who convene in a very intimate venue, sharing their music with one another and the audience. Its reputation has grown in just a few short years as a seminal place for creativity and discrete cultural tourism. Two years ago Hayes was asked to mount a version of it for the Sydney Opera House in Australia which was so successful that Culture Ireland asked him to give a taste of that to the New York audience. Many people in the know in the Irish music scene would be well aware of musicians like Cathal Hayden, Mairtin O’Connor, Seamie O’Dowd, David Power and iconic singer Iarla O’Lionaird who performed on the night along with Hayes’ longtime partner Dennis Cahill. 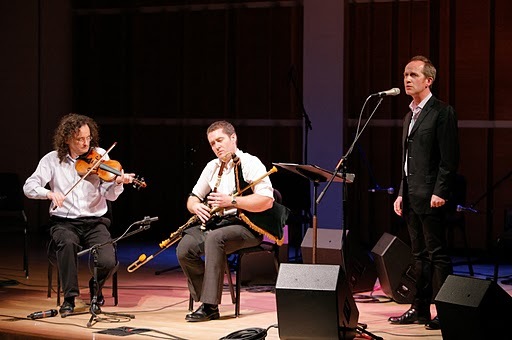 Not a formal concert per se, its potential and power projecting the past, present and future for the traditional music idiom was just what Imagine Ireland would like to project for possible programs for outlets looking to experience Ireland’s musical depth and heritage. Knowing what Martin Hayes’ Masters of the Tradition series is doing in Cork, and having just witnessed the explosive trio of O’Connor, Hayden and O’Dowd at the Ennis Trad Festival in November, the tangible results of the allure of traditional music is definitely an integral part of the Irish heartbeat and economy. It is a daring and exciting campaign, and if it stimulates the imagination as much as it does the cultural financial coffers of America and Ireland, the partnership between two old friends will remain strong and an attractive asset for both countries. You can find out more about it at www.imagineireland.ie. For New York City fans, Hayes and Cahill have a March 5 concert for the World Music Institute coming up at Symphony Space. It was just a year ago that the devastating earthquake that shook Haiti occurred claiming the lives of over 200,000 people, including the twin brother of Irish musician Gregory Grene. Andrew Grene was a senior official in the United Nations mission in Haiti doing great work at the time of the tragedy. A foundation in his name has been set up (www.andrewgrene.com) to continue efforts to help the disadvantaged people suffering down there as Haiti tries to recover. On Thursday, January 13, there is a musical benefit to help raise some funds and attention starting at 7 p.m. that will feature Joanie Madden and Cherish the Ladies, Eileen Ivers, the Mickey Finns and Gregory Grene’s Band the Prodigals. It takes place at Sullivan Hall in Greenwich Village (214 Sullivan Street). More details on donations available at the website. And speaking of Madden, she will be appearing up in New Haven area on Saturday, January 22 at 7:30 p.m. in the annual visit of the Pride of New York quartet to the East Haven Irish American Community Center (www.iacc-ct.com). Anticipating a sellout for the popular group that also includes Brian Conway, Billy McComiskey and Brendan Dolan, people are asked to make reservations and purchase tickets in advance through Pat Stratton (phone 203-248-8396) to ensure availability for this always lively occasion.